SOUTH: BP Servo at Yatala (Henry Hester Drive). Take Exit 38 off the M1 Freeway. NORTH: Woolworths Caltex Carseldine Roadhouse (1754 Gympie Rd, Carseldine QLD 4034). Be at the meeting point by 8:30am. All weekend rides depart at 9:00am sharp. to confirm you wish to join them on their ride. There is an official Steel Horses ride to Mount Glorious EVERY Tuesday morning (weather permitting). Meet every Tuesday morning at 9:30am at The Gap BP Servo at 850 Waterworks Road, The Gap, Brisbane. Enjoy coffee and breakfast/brunch at the top of the mountain. Same meeting place, same route, same destination, every Tuesday morning! VISITORS & GUESTS: Please phone Jak (0402 263 920) in advance and let him know you're coming on the Mount Glorious ride. Alternatively, if you see us sitting at our reserved tables at the Mount Glorious Cafe at the top of the mountain, then please call in and say hi! Tues 2 Mt Glorious Ride the twisty road to the magnificent Mount Glorious! Enjoy an early lunch & coffee when we reach the top. Depart at 10:00 AM sharp. Click HERE for complete details. PYRO'S WEEKEND AWAY TO TENTERFIELD! Tues 9 Mt Glorious Ride the twisty road to the magnificent Mount Glorious! Enjoy an early lunch & coffee when we reach the top. 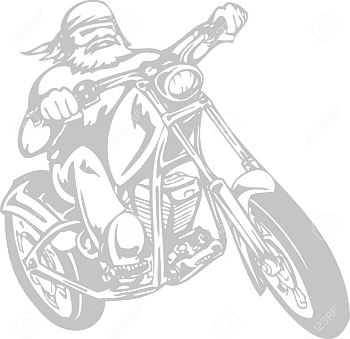 The Poker Run was cancelled last month due to wet weather. The Poker Run will be held today. THE FAMOUS STEEL HORSES POKER RUN! BE THERE FOR A GOOD RIDE AND GREAT PRIZES! STOP 1 & THE STARTING POINT: The usual West Ride meeting point - McDonalds Goodna. Departure is 9:00am sharp. STOP 5 & THE FINISHING POINT: Glamorgan Vale Pub for lunch, and awarding of prizes! Cost is $5.00 per hand. Tues 16 Mt Glorious Ride the twisty road to the magnificent Mount Glorious! Enjoy an early lunch & coffee when we reach the top. Tues 16 MEETING Lord Stanley Hotel. 994 Stanley Street East, East Brisbane. The meeting proper starts at 7.30pm; but come earlier for dinner! Tues 23 Mt Glorious Ride the twisty road to the magnificent Mount Glorious! Enjoy an early lunch & coffee when we reach the top. VV&VMC bunker. The Vietnam Veterans and Veterans MC are having an Anzac Day Dawn Service around their Cenotaph in the grounds of their bunker at 132 Meakin Road, Kingston. As we've done on Anzac Day for the last couple of years, Steel Horses will be attending (as a group). The service starts at 5:30 AM, and they are locking the entry gates at 5.15 AM sharp. So we can’t be late! Steel Horses members are to meet at McDonalds at Calamvale (678 Compton Road, Calamvale) at 4.30 AM (or earlier if you want coffee and such). We will leave McDonalds at 4.45 AM and ride off to the bunker. The Vietnam Veterans and Veterans MC's Anzac Day Dawn Service is a very moving event, and one that definitely shouldn't be missed. During the service, Steiny will be laying a wreath on their Cenotaph on behalf of our club. FOR CLUB MEMBERS ONLY: After the ceremony, we will be riding back to Hippy & Roach's place for a BBQ breakfast. The club will be providing all the food, etc. Tues 30 Mt Glorious Ride the twisty road to the magnificent Mount Glorious! Enjoy an early lunch & coffee when we reach the top. Good Friday (Public Holiday): Friday 19th April 2019. Easter Saturday (Public Holiday): Saturday 20th April 2019. Easter Sunday (Public Holiday): Saturday 21st April 2019. Easter Monday (Public Holiday): Monday 22nd April 2019. 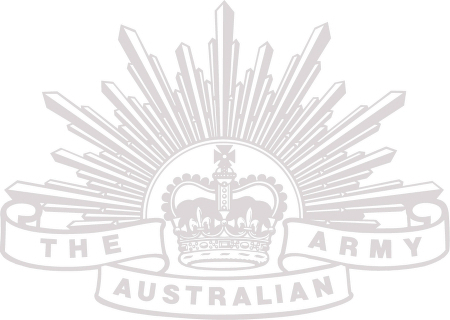 Anzac Day (Public Holiday): Thursday 25th April 2019. 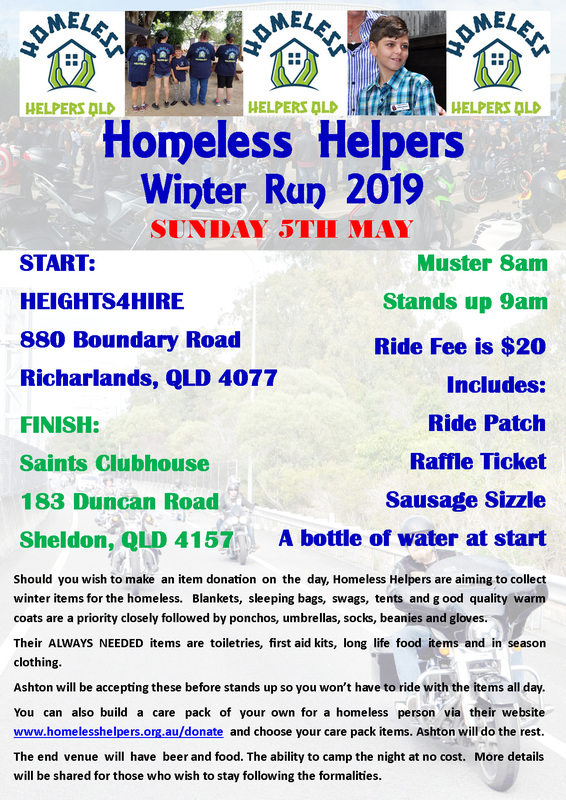 HOMELESS HELPERS WINTER RUN 2019. Show your interest in this event through their sign up button. You can select how many people in your group will be attending with no pre-payment needed at this time . $20 ride fee payable on the day. Ride fee includes - Ride Patch, Raffle Ticket, Sausage Sizzle & a bottle of water at the start. The ride will finish at The Saints Clubhouse - 183 Duncan Road, Sheldon, QLD 4157. Should you wish to make an item donation on the day, Homeless Helpers are aiming to collect winter items for the homeless. Blankets, sleeping bags, swags, tents and good quality warm coats are a priority closely followed by ponchos, umbrellas, socks, beanies and gloves. Their ALWAYS NEEDED items are toiletries, first aid kits, long life food items and in season clothing. Ashton will be accepting these before stands up so you won’t have to ride with the items all day. You can also build a care pack of your own for a homeless person via their website www.homelesshelpers.org.au/donate and choose your care pack items. Ashton will do the rest. Tues 7 Mt Glorious Ride the twisty road to the magnificent Mount Glorious! Enjoy an early lunch & coffee when we reach the top. We'll leave Caltex Carseldine Roadhouse at 9am. Then twisties ride for the first leg (Surprise route) Lunch at the D'Aguilar Hotel near Woodford on the Mount Mee turn off. After lunch we will be heading home via Wamuran, then the back roads to Clear Mountain via some twisties - finally to Eatons Crossing for our goodbyes. Tues 14 Mt Glorious Ride the twisty road to the magnificent Mount Glorious! Enjoy an early lunch & coffee when we reach the top. Tues 14 MEETING Lord Stanley Hotel. 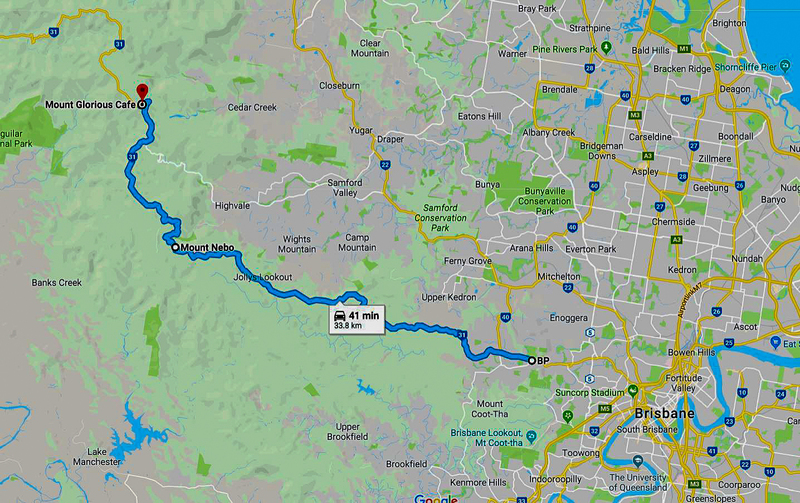 Meeting at Caltex Carseldine Roadhouse at 7.30 am for a 8.00 am departure - We will travel up to Peachester and Kenilworth (break) - Gympie (fuel & break) - Kilkivan (lunch), Wondai and Kingaroy (overnight). Total distance for Saturday is about 370 km. Stay overnight at the Pepper Tree Cabins (7 Evelyn Street Kingaroy. Phone 07 4162 8008). Their cabins are air conditioned, and have ensuites. We'll take a courtesy bus up to the local Kingaroy RSL where we'll have dinner. The ride home is straightforward from Kingaroy - Crows Nest -and Esk - Home. Total distance for Sunday is about 220 km. Tues 21 Mt Glorious Ride the twisty road to the magnificent Mount Glorious! Enjoy an early lunch & coffee when we reach the top. Tues 28 Mt Glorious Ride the twisty road to the magnificent Mount Glorious! Enjoy an early lunch & coffee when we reach the top. Labour Day (Public Holiday): Monday 6th May 2019. Mothers Day: Sunday May 12th 2019. We'll meet at Caltex Carseldine Roadhouse - 1st stop Peachester - 2nd stop Kenilworth - Lunch is at Mapleton - Home via Landsborough and down to BP South Burpengary for our goodbyes. Approx. 240km. Tues 4 Mt Glorious Ride the twisty road to the magnificent Mount Glorious! Enjoy an early lunch & coffee when we reach the top. Tues 11 Mt Glorious Ride the twisty road to the magnificent Mount Glorious! Enjoy an early lunch & coffee when we reach the top. Tues 18 Mt Glorious Ride the twisty road to the magnificent Mount Glorious! Enjoy an early lunch & coffee when we reach the top. Tues 18 MEETING Lord Stanley Hotel. Tues 25 Mt Glorious Ride the twisty road to the magnificent Mount Glorious! Enjoy an early lunch & coffee when we reach the top. SATURDAY EVENING 6 BBQ's & FIRES!! The inaugural Steel Horses "FIRE PIT NIGHT"! Sit around a classic campfire/fire pit this evening with your Steel Horses mates. Fantastic! Nothing fancy, just good company and a warm fire. What an awesome way to spend the evening. BYO Meat, salads, alcohol, marshmallows, and anything else you think you might need. 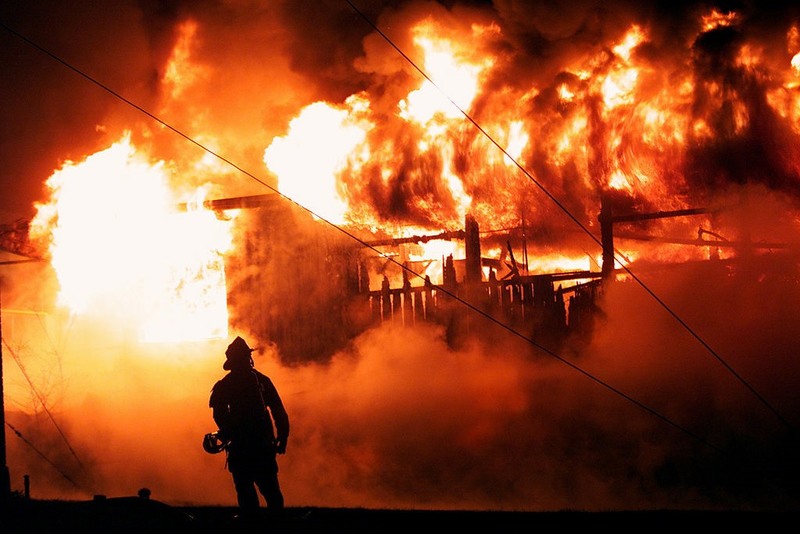 Pyro and Phoenix are supplying the BBQ and Fire Pit. BYO fold-up chairs to use while sitting around the fire! There is ample parking for bikes/cars off street. Staged at the Cleveland Showgrounds: Long Street, Cleveland, Brisbane. Club Laverda is once again putting on its Concours show. This is an excellent annual event that's now in its 31st year!! 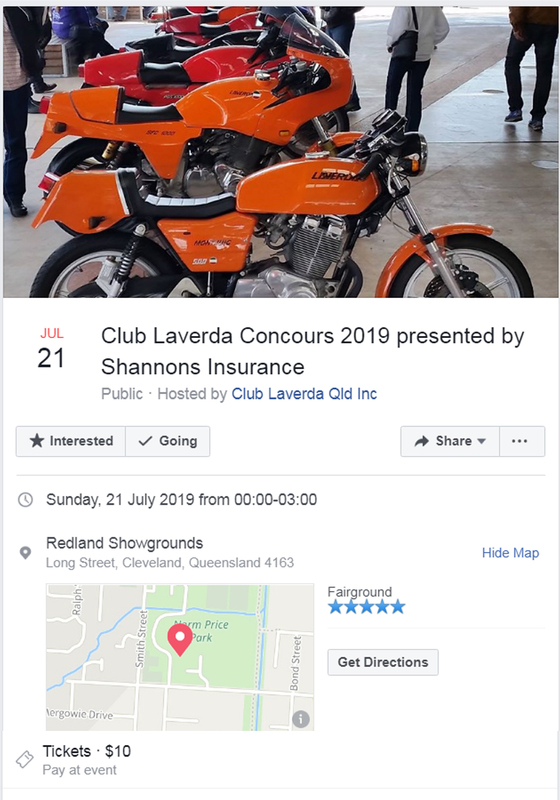 Click HERE for the Laverda Concours 2019 information on Facebook. 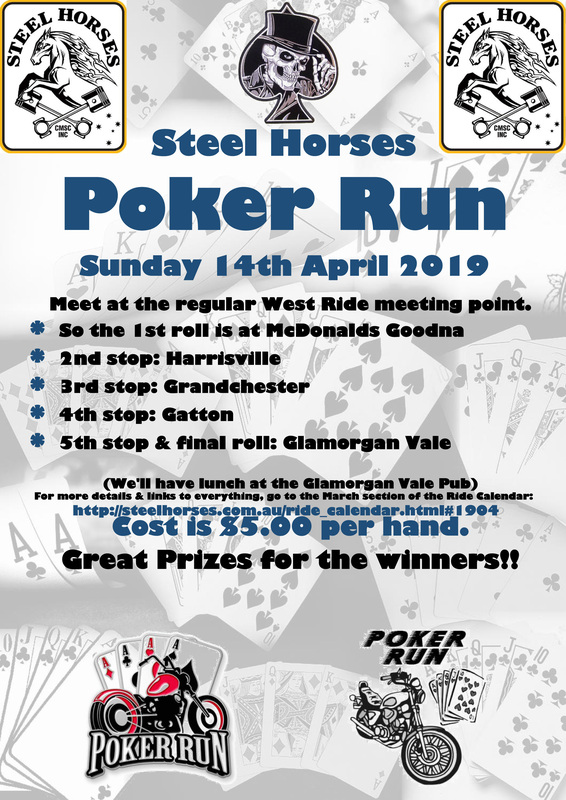 Once again, Steel Horses will have a strong presence there, complete with our big marquee (and BBQ), promoting our club to potential new members. As well, it's a great day out for all our existing members! Click HERE to see some photos of the Steel Horses display at the Laverda Concours in 2015. This is a pretty big event, and about 8000 people usually attend. The Laverda Concours attracts large numbers of motorcycle trade stalls, numerous motorcycle enthusiast club displays (including Steel Horses), and motorcycle enthusiasts both local and interstate. There's plenty of free parking for motorcycles. Entertainment includes a wide variety of food vendors, free face painting, kiddie’s rides, and live music provided by the popular local act, The Dave Ritter Band. Admission is free to children under the age of 15 years and $10 for all other patrons. Admission includes on-site motorcycle parking. Sat & Sun 27 - 28 South to NSW CHRISTMAS IN JULY!! A long-running annual event for our club, and a great weekend away! Meeting point will be MacDonalds Beaudesert (114 Brisbane Street, Beaudesert). This MacDonald's is open 24/7, so you can have breakfast, and/or a hot cup of coffee, while waiting for the ride to start at 8:00am. DEPARTURE TIME IS 8:00AM SHARP. Have a full tank of fuel when you arrive at MacDonalds Beaudesert. Just down the street from MacDonalds is the Caltex South servo at 2 Telemon St, Beaudesert where you can fill up with gas. It will be a 5.5 hour run to our destination: the Bowra Hotel (33 High Street, Bowraville, NSW) in Bowraville. The Bowra Hotel (established in 1912) is a landmark in the Nambucca Valley, renowned for its enviable reputation with tourists and locals alike and for providing warm, traditional service in a cosy heritage bar. Total cost will be only $60. This includes your accommodation on Saturday night, a full-on 'Christmas' dinner on Saturday night, and breakfast on Sunday morning. Boots (0434 748 404) requires a $40 holding deposit. payable before May 31. Room bookings will be on a first-in best-dressed policy. As in previous years the deposit is non-refundable (and will be put on the bar for attendees on behalf of anyone pulls out). For more details about this ride, hotel bookings, costs, etc, please contact Boots (0434 748 404). Tues 6 Mt Glorious Ride the twisty road to the magnificent Mount Glorious! Enjoy an early lunch & coffee when we reach the top. Tues 13 Mt Glorious Ride the twisty road to the magnificent Mount Glorious! Enjoy an early lunch & coffee when we reach the top. Tues 20 Mt Glorious Ride the twisty road to the magnificent Mount Glorious! Enjoy an early lunch & coffee when we reach the top. Tues 20 MEETING Lord Stanley Hotel. Tues 27 Mt Glorious Ride the twisty road to the magnificent Mount Glorious! Enjoy an early lunch & coffee when we reach the top. Royal Queensland Show(Brisbane Area Only) (Public Holiday): Wednesday 14th August 2019. Tues 3 Mt Glorious Ride the twisty road to the magnificent Mount Glorious! Enjoy an early lunch & coffee when we reach the top. Tues 10 Mt Glorious Ride the twisty road to the magnificent Mount Glorious! Enjoy an early lunch & coffee when we reach the top. Tues 17 Mt Glorious Ride the twisty road to the magnificent Mount Glorious! Enjoy an early lunch & coffee when we reach the top. Tues 24 Mt Glorious Ride the twisty road to the magnificent Mount Glorious! Enjoy an early lunch & coffee when we reach the top. Fathers Day: Sunday 1st September 2019. Grandparents Day: 8th September 2019. Tues 1 Mt Glorious Ride the twisty road to the magnificent Mount Glorious! Enjoy an early lunch & coffee when we reach the top. Tues 8 Mt Glorious Ride the twisty road to the magnificent Mount Glorious! Enjoy an early lunch & coffee when we reach the top. Tues 15 Mt Glorious Ride the twisty road to the magnificent Mount Glorious! Enjoy an early lunch & coffee when we reach the top. Tues 15 MEETING Lord Stanley Hotel. Tues 22 Mt Glorious Ride the twisty road to the magnificent Mount Glorious! Enjoy an early lunch & coffee when we reach the top. Tues 29 Mt Glorious Ride the twisty road to the magnificent Mount Glorious! Enjoy an early lunch & coffee when we reach the top. Queen's Birthday (Public Holiday): Monday 7th October 2019. Halloween: Thursday 31 October 2019. Tues 5 Mt Glorious Ride the twisty road to the magnificent Mount Glorious! Enjoy an early lunch & coffee when we reach the top. Tues 12 Mt Glorious Ride the twisty road to the magnificent Mount Glorious! Enjoy an early lunch & coffee when we reach the top. Tues 19 Mt Glorious Ride the twisty road to the magnificent Mount Glorious! Enjoy an early lunch & coffee when we reach the top. Tues 19 MEETING Lord Stanley Hotel. 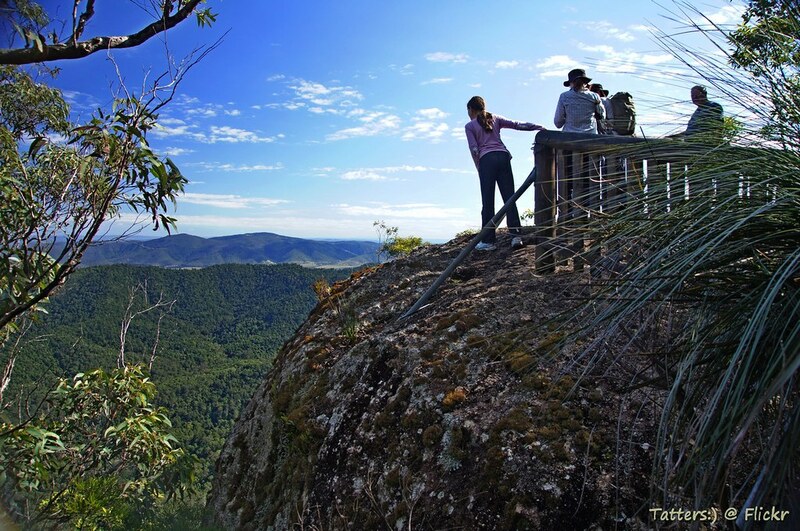 Tues 26 Mt Glorious Ride the twisty road to the magnificent Mount Glorious! Enjoy an early lunch & coffee when we reach the top. Tues 17 MEETING Lord Stanley Hotel. Tues 31 Mt Glorious Ride the twisty road to the magnificent Mount Glorious! Enjoy an early lunch & coffee when we reach the top. Christmas Day (Public Holiday): Wednesday 25th December 2019. Boxing Day (Public Holiday): Thursday 26th December 2019.